刘雪娇, 王炳源, 任永成, 赵阳, 刘德臣, 张冬冬, 陈序, 刘磊磊, 程诚, 刘飞燕, 周琼桂, 陈国桢, 洪士皓, 刘丹, 胡思琦, 张明, 胡东生. Liu Xuejiao, Wang Bingyuan, Ren Yongcheng, Zhao Yang, Liu Dechen, Zhang Dongdong, Chen Xu, Liu Leilei, Cheng Cheng, Liu Feiyan, Zhou Qionggui, Chen Guozhen, Hong Shihao, Liu Dan, Hu Siqi, Zhang Ming, Hu Dongsheng. Liu Xuejiao, Wang Bingyuan, Ren Yongcheng, Zhao Yang, Liu Dechen, Zhang Dongdong, Chen Xu, Liu Leilei, Cheng Cheng, Liu Feiyan, Zhou Qionggui, Chen Guozhen, Hong Shihao, Liu Dan, Hu Siqi, Zhang Ming, Hu Dongsheng. A cohort study on body mass index and risk of all-cause mortality among hypertensive population[J]. 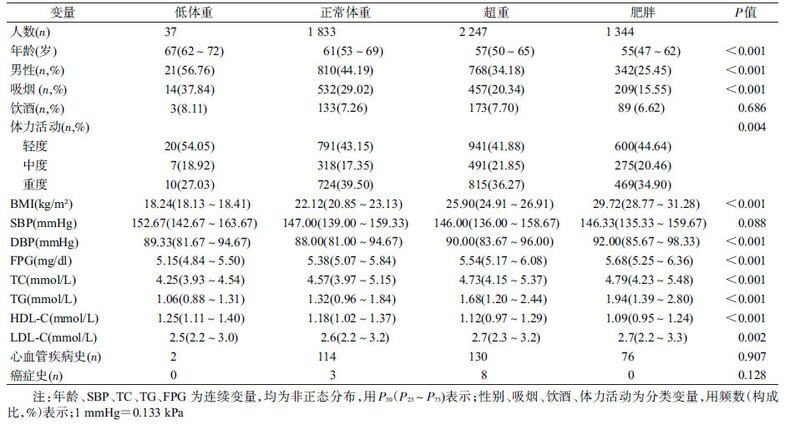 Chinese Journal of Epidemiology, 2018, 39(7): 914-919. Abstract: Objective To investigate the relationship between body mass index (BMI) and all-cause mortality in hypertensive population. Methods All participants were selected from a prospective cohort study based on a rural population from Henan province, China. Cox proportional hazards regression models were used to estimate the associations of different levels of BMI stratification with all-cause mortality. Restricted cubic spline models were used to detect the dose-response relation. Results Among the 5 461 hypertensive patients, a total of 31 048.38 person-years follow-up was conducted. The median of follow-up time was 6 years, and 589 deaths occurred during the follow-up period. Compared to normal weight group (18.5 kg/m2 < BMI < 24.0 kg/m2) the multivariate-adjusted hazard ratios for all-cause mortality associated with BMI levels (< 18.5 kg/m2, 24-28 kg/m2, and ≥ 28 kg/m2) were 0.83 (95%CI:0.37-1.87), 0.81 (95%CI:0.67-0.97), and 0.72 (95%CI:0.56-0.91), respectively. The dose-response analysis showed a nonlinear, reverse "S" shaped relationship (non-linearity P < 0.001). Conclusion Overweight or obese might have a protective effect on all-cause mortality in hypertensive population, which supports the "obesity paradox" phenomenon. 肖瑛琦, 刘娅, 郑思琳, 等. 体质指数、腰围、腰臀比与社区中老年居民高血压关系研究[J]. 中华流行病学杂志, 2016, 37(9): 1223–1227. 杨香玉, 张明, 罗新萍, 等. BMI、腰围和腰身比与2型糖尿病发病关系的队列研究[J]. 中华预防医学杂志, 2016, 50(4): 328–333. 吴穷, 李慧, 任妍, 等. 体质量指数对慢性心力衰竭患者预后的影响[J]. 内科理论与实践, 2016, 11(3): 176–179. 张金霞, 龚志华, 冯颖青, 等. 老年男性高血压患者体质指数对心血管事件的影响[J]. 中华心血管病杂志, 2015, 43(3): 239–243. 韩成义, 罗新萍, 张明, 等. 静息心率与代谢综合征关系的队列研究[J]. 中华流行病学杂志, 2016, 37(12): 1653–1657. 周俊梅, 罗新萍, 王书, 等. 河南省农村地区居民血脂异常患病率及其危险因素调查[J]. 中华预防医学杂志, 2016, 50(9): 799–805. 中国肥胖问题工作组数据汇总分析协作组. 三我国成人体重指数和腰围对相关疾病危险因素异常的预测价值:适宜体质指数和腰围切点的研究[J]. 中华流行病学杂志, 2002, 23(1): 5–10. 中国高血压防治指南修订委员会. 中国高血压防治指南(2010)[J]. 中华高血压杂志, 2011, 19(8): 701–743. Messerli FH, Sundgaard-Riise K, Reisin E, et al. Disparate cardiovascular effects of obesity and arterial hypertension[J]. Am J Med, 1984, 76(5): 808–812.